Chances are very good you were immediately drawn to the first title and you probably wanted to explore the content. The second title probably aroused curiosity, some dread and potentially left you wanting... That's the power of a good title, headline... while we are all taught never to judge a book by its cover, a really good title and headline can make all the difference in the world! Yes… We want you to game the Mission Grading in a good way. Moving your title from “Visit My Web Site” to something more powerful doesn’t just get you an “A” grade, you actually get your content in front of more people and engage more people with your creativity. 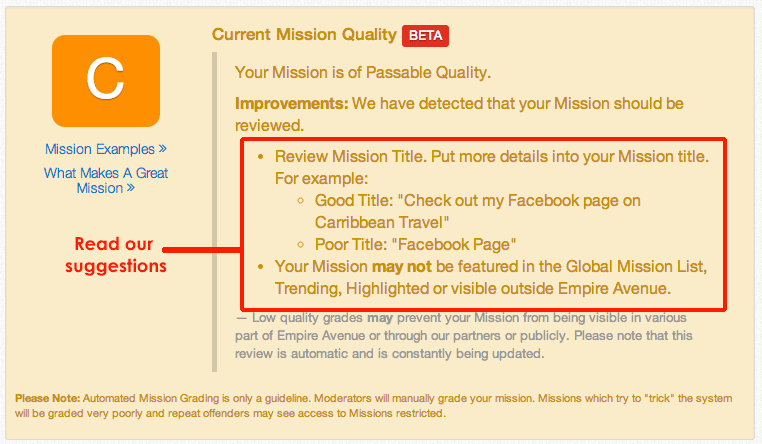 We've even updated our examples page for more about Missions. Do you have feedback on links that can help people write great content and great marketing? Please post them in the comments, or through the Empire Avenue community here!